Yu-Gi-Oh! R Duel Round 8: "Dweller in the Dark!!" Gekko Tenma 「天馬月行, Tenma Gekkō」 is Yako Tenma's older brother, although only slightly older, since they are identical twins. Gekko's name most likely derives from "gekko" meaning moon (something that Yako later alludes to), and "Tenma" which came from Pegasus' Japanese alias in Reshef of Destruction, Taiyo Tenma, as he and Yako were initially adopted by Pegasus. He is commonly called and described as being a "perfect Duelist". 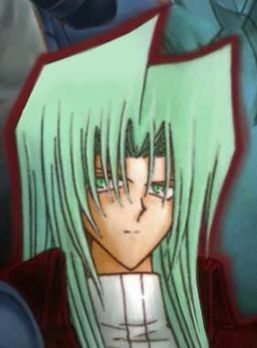 However, Gekko later comes to believe that he is a "perfected Duelist", as everyone else he Dueled improved while he didn't. Gekko is identical in appearance to his twin brother Yako, with long silver-green hair. However, his attire is similar, but noticeably different, wearing a heavy maroon coat over what appears to be a white version of Yako's clothes, though he does not wear gloves. In the past, both he and Yako wore dark suits. Gekko is a far more calm and composed individual than Yako, and usually does not raise his voice. He was much more upbeat and cheerful in his youth (with Yako being the more quiet and shy individual at that time), but is more subdued following the death of Pegasus. Following the loss of his adopted father, he became opposed to seeing others suffer the way they did, which was part of the reason that he assisted Yugi Mutou. He is also fiercely dedicated to his brother, and opposed him in an effort to save him, and regretted that he was forced to help him deeply, as well as Yako's actions and that he had been unable to stop them himself. During the early years before the time of the Duelist Kingdom tournament took place, Yako and Gekko were adopted by Maximillion J. Pegasus and raised and trained to be Duelists. It is unknown what happened to their parents. Throughout the years, Yako began to develop a strong hatred for Gekko because he was constantly denounced in Gekko's presence such as being called "a bad copy". After one Duel, Yako's strategy fails to Gekko's Deck. Gekko says that it was a good strategy but probably would have worked with better cards that he begins to write down on a list. However, Yako stands and runs away in shame. Later on, Gekko's body was hacked by his brother, Yako Tenma, before the R.A. Project began. During Gekko's debut, Yako was controlling his body to make it seem as if it was Yako himself. He forces Yugi Mutou to a Duel and (against his own judgment) Summoned "The Wicked Dreadroot" which allowed Yako to advance the RA Project to the next stage. After having been rescued by Croquet from Yugi's final attack with "Arcana Knight Joker" and, there-by, losing the Duel, he decides to help Yugi defeat Yako and stop the R.A. Project. He states that even though he too would like to see Master Pegasus' face again, he does not want to have to sacrifice people like Yako. Gekko's first Duel with Yugi is against Ted Banias, and he is told by Keith that if he loses, Yugi will be barred from ascending furthur. Although at first it seems as if Gekko is helpless, he turns the Duel around and ultimately annihilates Banias after encouragement from Yugi. His second Duel was much later against Richie Merced, another Duelist who was taken in by Pegasus. Throughout most of this Duel, it seems as if Gekko is winning his way slowly, however, Richie manages to turn the tides on him and claim victory. Richie later claims that Gekko's haste to save Yako was what cost him the game. This meant that Yugi would not be allowed any further up the KaibaCorp Skyscraper. But Yugi and Gekko are relieved of this when Mokuba Kaiba opens the locked door for them from the control room, though Gekko is initially unwilling to continue on. When Yugi and Gekko make it to the next room, Jonouchi and Honda come out of an air vent in the same room. As soon as Jonouchi comes out, he tells Yugi to stand back and punches Gekko, whom he mistakes for Yako, extremely hard throwing him against the wall. After figuring out that he is indeed Yako's twin, Jonouchi apologizes, but Gekko denies it saying that he deserved it. When Keith Howard arrives to Duel Jonouchi, Gekko warns him about the significance of the Black Disk, realizing that Keith had to have defeated Richie in order to obtain it. During the final Duel between Yugi and Yako, Gekko helps to release Yako from the spell set on him by "The Wicked Avatar". He had given Yugi the "Divine Evolution" card, which he had used when controlled by Yako. Gekko tells Yako that even though he may have been called "perfect," that means that he cannot progress or become stronger unlike Yako. This allows Yako to realize that he can actually surpass his brother which gives him a new purpose and a strive to finish the Duel with Yugi. After the Duel, Yako thanks Gekko for not letting him give up before tearing "The Wicked Avatar" card to pieces. In a flashback, he defeats Yako using "Rogue Doll". 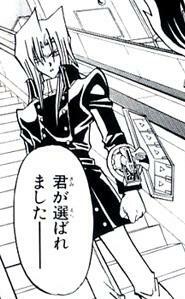 In order to test the powers of "The Wicked Dreadroot", Yako possesses Gekko and forces him to Duel Yugi. The Deck focused on swarming the field with "Seraphim" monsters in order to bring out "Dreadroot", while countering the opponent with cards such as "The Selection". Gekko plays an "Elf" Deck, which focuses on swarming and using the effects of the "Elves" to support one another. He makes heavy use of Equip Spell and Trap Cards, even using "Armament Reincarnation" to use them as monsters. This page was last edited on 23 April 2016, at 03:13.